They say breakfast is the most important meal of the day and yet it is probably the most overlooked. Given that it is one of the most profitable sales streams, any budding entrepreneur would not let this slip under the radar. This year at bartlett mitchell we have turned up the volume on breakfast as a whole and at the end of the year I’m launching a new concept to give our customers a tasty wake-up call. During my research I’ve discovered a few comforting facts about breakfast and thought I would share a few of them with you. Use 50/50 wholemeal and white plain flour or even add bran flour. You can make the batter the night before, it keeps well in the fridge. 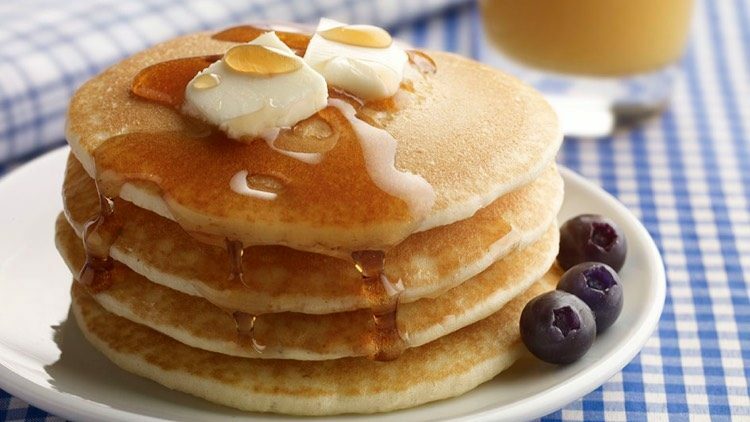 Maple syrup is the classic, but you can add fruit or even lemon and sugar. It’s the staple these days and yet when I started out as a chef no one touched the stuff! Low GI (glycaemic index) help avoid the ups and downs in blood sugar levels, and because it’s slow release it helps get you through to lunchtime. Egg is full of vitamins, iodine, zinc and protein, essential for energy and to help the body repair. Be good and use wholemeal bread for your soldiers. I add a bit of marmite butter to my soldiers. We make our own Low-fat yoghurts using skimmed milk and use it in desserts as well as for breakfast. A few berries or banana whizzed together make a great topping. Lots of calcium and not too much fat. Omega-3 rich salmon is a great source of protein and combined with the eggs are even better. Be sparing on the butter in the scramble as the salmon has an unctuous oil which takes away that need. Weekend are busy times with everyone in a household doing different things. The reality is that everyone has busy days and probably the best time for the whole family to get together is at breakfast – even for just ten minutes. Set a good eating standard and remember you are the best food role-model for your kids. If they see you stop to eat well, they will too. Finally if you have a no nibbles rule after 9pm then you’ll find the family that much more hungry for breakfast. What are you going to have for breakfast tomorrow?